Today I was going to show you at least part of the laundry room reveal but……… 🙁 Over the weekend I’ve been teasing you with pictures of painting the ceiling and it looks like all that tape and the red paint color has many of you worried. Rest assured, it came out beautiful, even more beautiful that I had imagined. However, by the time I moved over to my DIY light fixture, my luck ran out (again!). I’m planing to make a last dash attempt at saving it today. Hoping against hope that this one doesn’t end up the way my vintage lace chandy did. If all goes well at least part 1 of the reveal will be on the blog tomorrow. 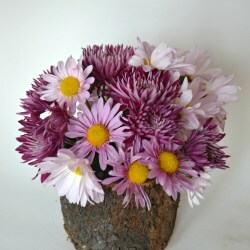 For now, a simple Daisy centerpiece. 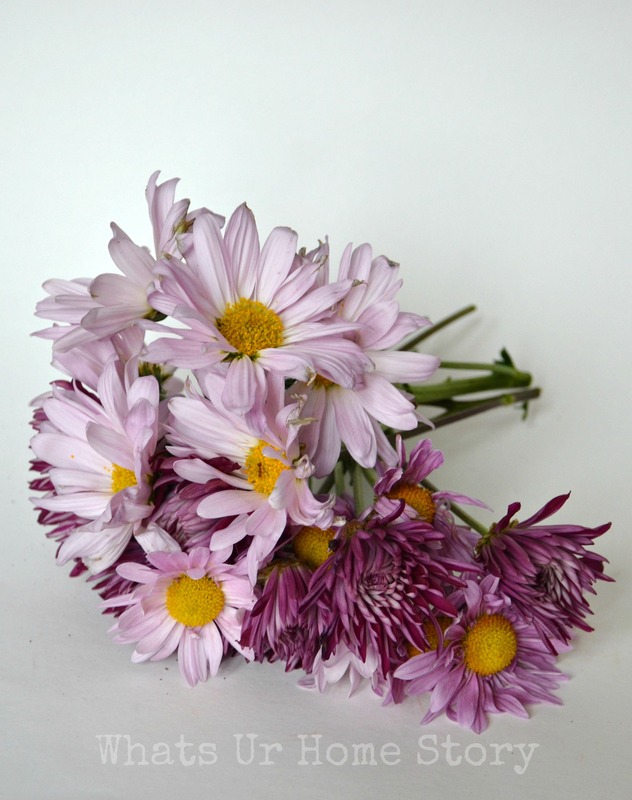 All the 3 varieties of flowers were from a grocery store bouquet and were varying shades of the same color, lavender. 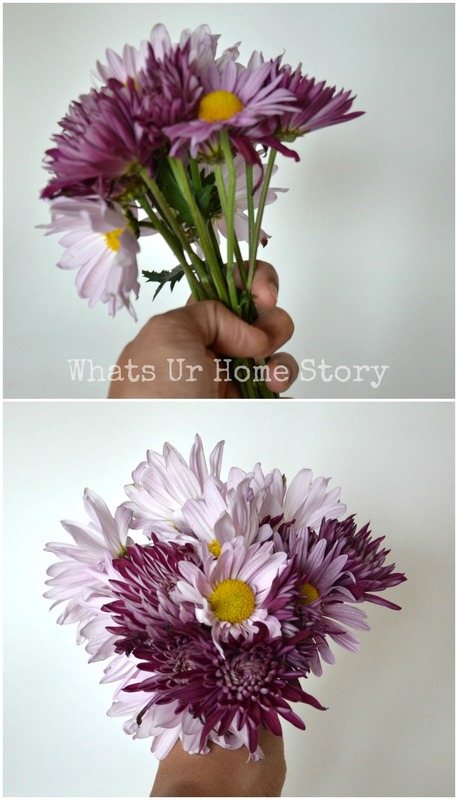 When it comes to flowers I’m a ‘go by the feel’ person but for this post I’ve tried to stop at each step and document what my thinking process is when I arrange flowers. Rule #1 – Breaking it down into simple steps takes the guess work out of mixing and matching the colors. #2 – Working with the same height is the easiest arrangement there is! No need to worry about adding height and fillers. #3 – If working with different colors intimidates you, you can always stick to one color. For those slightly brave souls but not ready for full on color explosion go with different shades of the same color, like I did here. Cut a long stem and place it in the vase to see what height works best. 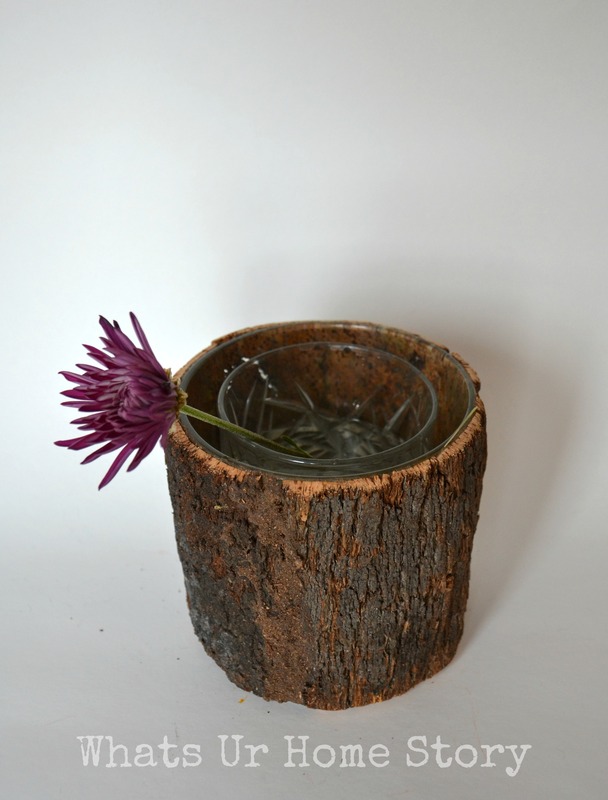 Adjust the height of the stem to what works with the size of the vase. Keep in mind that the insides of the vase shouldn’t be visible once the arrangement is done. Cut all your stems the same height and start gathering them in your hand, one color at a time. As you are adding the second color turn the flowers to face you. Slowly move the second color flowers around so the color is distributed evenly around. Add the third color the same way. Gently place them in the vase and you are good to go! Sweet and simple and the best, very easy. What is your favorite go to flower?